Frankly... 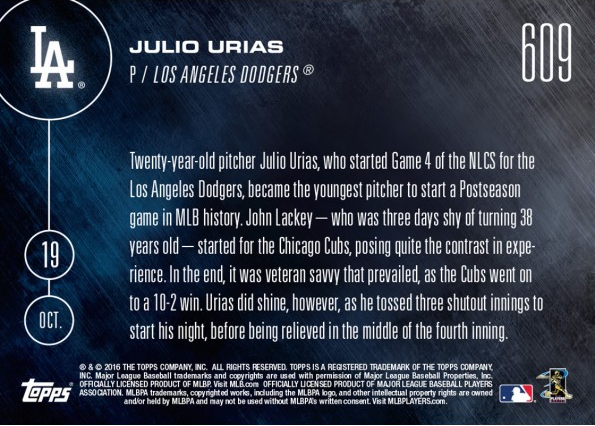 It's a bit depressing to see that this card will exist... Not that I have any disdain for the player portrayed on it... After all, Julio remains one of the more dynamic and highly-rated pitching prospects in the game today. Rather, its the resultant end that gives me heartburn. Last nights record start by Urias, as the youngest starting pitcher in Postseason MLB history, while certainly notable, left me with a taste of something bitter. We got destroyed last night, and one of the last things I want is to be reminded of it. That's what this card does. 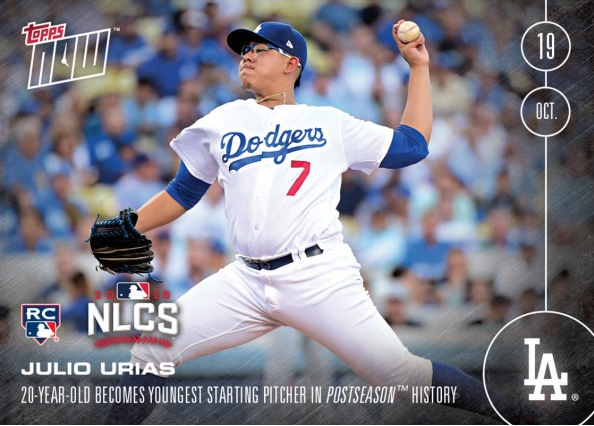 Twenty-year-old pitcher Julio Urias, who started Game 4 of the NLCS for the Los Angeles Dodgers, became the youngest pitcher to start a Postseason game in MLB history. John Lackey -- who was three days shy of turning 38 years old -- started for the Chicago Cubs, posing quite the contrast in experience. In the end, it was veteran savvy thaty prevailed, as the Cubs went on to a 10-2 win. 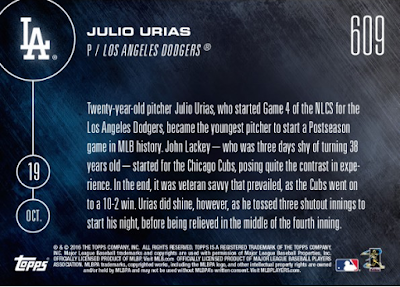 Urias did shine, however, as he tossed three shutout innings to start the night, before being relieved in the middle of the fourth inning. UPDATE: The print run for this card is 475 copies.